This morning’s devotion comes to us from Laurel Marr. Paul, the chief of sinners, tells us God’s answer when he pleads with God to remove a thorn in his flesh. “My grace is sufficient for you for power is made perfect in weakness” (2 Cor 12: 7-10). Paul makes it known to us that this thorn is given to him. In ancient literature, a piercing of the flesh by at thorn or an arrow signified love’s invasion of the body – a common theme in love poetry. The love of God is found in suffering. The heart of God and God’s willingness to share in the sufferings of the world God so loves come to articulation in the event of the cross. God is present in the contrary: where we see death, God is present with the promise of life, where we see deterioration and dissipation, God is present with creativity and newness, where we see natural law and contingency, God is present with faithfulness and openness. This kind of love is found in the cross where God and His Christ are the operators. There is suffering in our lives brought on by God, and to bear a cross is the suffering that brings the crown of glory. It is the death of sin, the end of disbelief, and therefore the growth of faith (our new creation). The love of God does not find, but creates that which is pleasing to it, and God creates from the nothing that he reduces us to in suffering. He rids us of the old so that the new may begin. Jesus tells Nicodemus that unless a man is born again he cannot see the Kingdom of God – baptism (Jn 3:3). Other virtues may be perfected by doing, but faith, hope and love, only by suffering, by being passive under the divine operation. The soul is taken hold of [by the pure word of God]; it is stripped of its own garments, of its shoes, of all its possessions, and is taken away by the word into the wilderness, to invisible things, into the vineyard, and into the marriage chamber. But this leading, this taking away, and this stripping, miserably tortures [the soul]. For it is a hard path to walk in, and a straight and narrow way, to leave all valuable things, to be stripped of all natural senses and ideas, and to be led out of all those things which we have been accustomed; this indeed, is to die, and to descend into hell. This dying brought on through suffering causes us to finally know and speak the truth about God exposing the idols we have created of Him. His saving work seems strange, but we must first die so that we may live. It is in our suffering that we cry out (like Job) to God as the ultimate answer to it all. When Jesus asks the disciples who people say that he is, they respond with John the Baptist, Elijah, one of the prophets…” but when He asks them, “Who do you say that I am?” Peter answered him, “ You are the Messiah.” After sternly ordering them not to tell anyone about him, Jesus openly foretells His death and resurrection. Peter pulls him aside and rebukes him, so Christ in turn rebukes Peter with the words, “Get behind me, Satan! 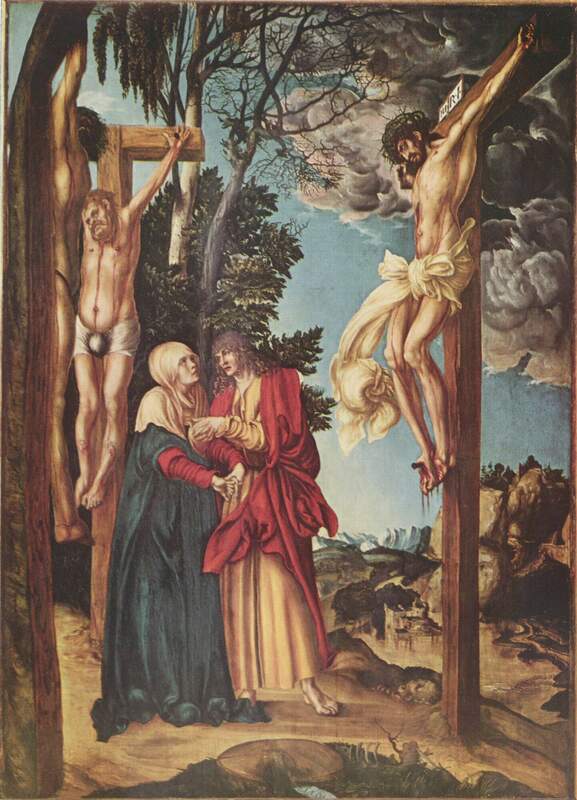 For you are setting your mind not on divine things, but on human things.” He called the crowd with his disciples, and said to them, “If any want to become my followers, let them deny themselves, take up their cross, and follow me.” We will lose our lives on account of our salvation; we will die so we can live. We follow after Christ in the way of the cross, and it is here we come to know the God that we are looking for in our terms of human glory. In the way of the cross, we worship God as he intends us to worship him. By this passive experience of suffering, we come to know Christ as the Messiah, and we come to know that God is the ultimate answer to it all. As we experience our own sinfulness before the holy God who declares “I am the Lord your God”, we may want to run away from him, but in this declaration, God promises to be our God! He promises not to leave us or to let sin and death have the final say over our life. Christ mirrors God’s heart before us and as we come to know Jesus, we come to know God himself, disguised in human flesh and humility. He calls us in his grace to experience him where he bled and died – on the cross. It is here that will we come to know the passion of the God who saves sinners. Perfect description of sanctification and how it works. Thanks for writing and sharing.